Alright, listen up, people. Our fugitive has been on the run for ninety minutes. Average foot speed over uneven ground barring injuries is 4 miles-per-hour. That gives us a radius of six miles. What I want from each and every one of you is a hard-target search of every gas station, residence, warehouse, farmhouse, henhouse, outhouse and doghouse in that area. Checkpoints go up at fifteen miles. Your fugitive’s name is Dr. Richard Kimble. Go get him. Name: Richard Kimble. Profession: Doctor of Medicine. Destination: Death Row, State Prison. Richard Kimble has been tried and convicted for the murder of his wife. But laws are made by men, carried out by men. And men are imperfect. Richard Kimble is innocent. Proved guilty, what Richard Kimble could not prove was that moments before discovering his wife’s body, he encountered a man running from the vicinity of his home. A man with one arm. A man he had never seen before. A man who has not yet been found. Richard Kimble ponders his fate as he looks at the world for the last time. And sees only darkness. But in that darkness, fate moves its huge hand. There is a penguin on the loose. Penguin no. 337 escaped from Tokyo Sea Life Park. It scaled a 4 metre/13 foot wall and got through a fence. Now it is hanging around Tokyo Bay which is full of fish. Apparently it will be difficult to catch. This kind of news article is always popular in Japan. Occasionally a seal is spotted in a river, say, and then there is a mass media frenzy and even soft toys as the spottings and the boom last. Zoological note. Or should that be an ornithological note. Penguin no. 337 is a Humboldt penguin. The penguin in the photo is a rockhopper penguin. 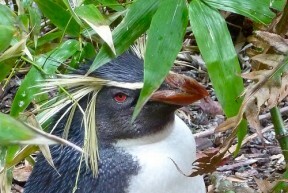 Rockhopper penguins have that cool punk look. And why do penguins have that wild reputation anyway? The four penguins in the Madagascar movies and TV spinoff were all like special agents. So it seems running an hour a week can help men live 6 years longer and women live 5 years longer. The wild man back in custody. Thanks Carina. His luck ran out! Hi Niall, Thank you for this nice topic. I like penguins very much, my son Manuel’s dearest mascot was a king penguin teddy, and now he uses Linux in his notebook. I saw Happy feet and The march of the penguins and would recommend them to every one. In my walks I usually stay some time by the pond watching the different birds who migrate and take photos of them, a poor sustitute to penguins.